Friendly and loving, your pet schnauzer is an important part of your family. 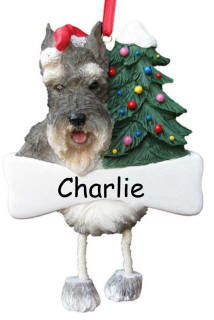 Hang an ornament on your Christmas tree this year, with your schnauzer's name and the year if you like. Personalization is done by hand. This ornament is gift boxed. This schnauzer ornament has a life-like depiction of the breed, dangling legs, and a banner across the chest which can be personalized.